Review - Rangrage.in - Online Lifestyle Store | Buy Hand Painted Jeans Online | The Shopaholic Diaries - Indian Fashion, Shopping and Lifestyle Blog ! Don't you think the weather is acting a lot crazy lately (in parts of Delhi-NCR)? I mean it's sunny a few days and over the weekends it starts raining. Well, I am not complaining until it remains pleasant and I can spend my weekend shopping and chilling with my friends :D.
So, today I am back with another Review featuring an exciting online lifestyle store - Rang Rage - which has made its mark by presenting Art in the form of apparel, accessories, home decor and more. Rang Rage is a brainchild of a bunch of art-crazed people who want to infuse art in everyday life and make it not only affordable but also usable. They want each of their products to tell an inspiring tale. Based in Indore, Rang Rage is a design house of apparels and home décor which is set to create a strong social impact on the artists and their families. The highlight of the brand is their hand-painted designs, be it a cushion, tissue box, alarm clock, bag or clutches. Each of the design shows the efforts and skills of the artists who try their best to make the item unique and classy. 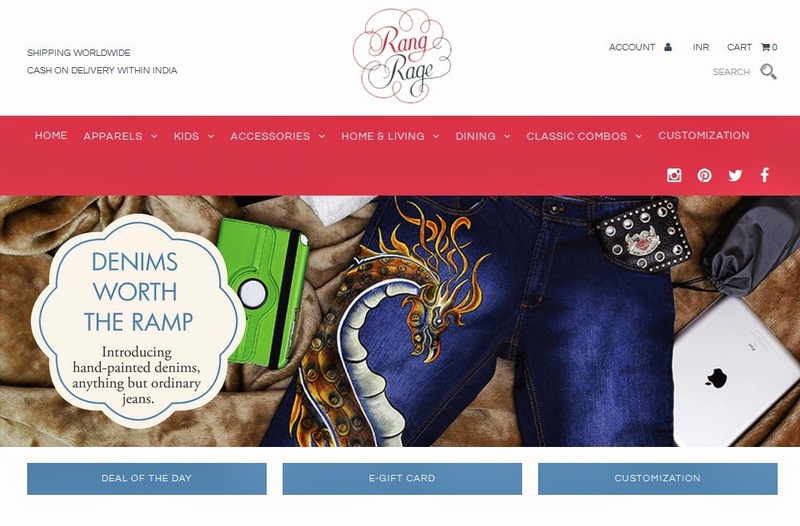 Rang Rage offers a wide variety of products including apparel for kids, card holders, clutches, handbags, cushion covers, wall paintings, dining combos and more, but what caught my attention the most is their exclusive range of Hand Painted Denims for Men & Women. Whenever you step out looking for a perfect pair of jeans, don't you wish that you could find a pair which had all the elements you desire - perfect fit, color, wash and a unique design which reflects your personality? Well, I could see all of these features which I desire from my Perfect Denims in their trendy range. Rang Rage offers trendy denims for men & women in unique designs which give an extraordinary appeal to a simple pair of jeans. Available in light and dark acid washes, you can easily find a design which matches your personality and mood. Each hand-painted denim has been created in 48 man hours. Hand painting a pair of denims is an intricate process and each design requires the artist to paint some parts, then pause so it could dry and start painting the rest again. The more intricate the design, the more number of man hours it takes. 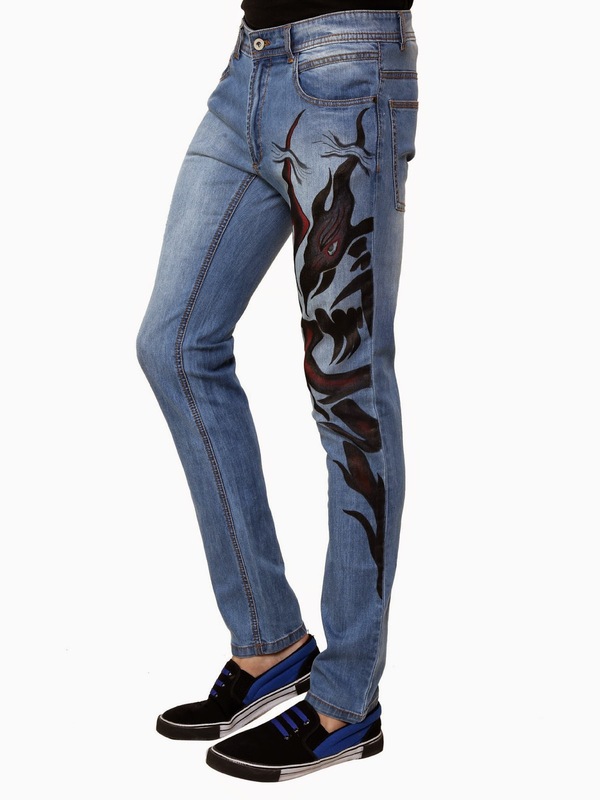 So, these features ensure that you are not only getting a unique design but also high quality which will make these denims a priced possession. Rang Rage also offers hand painted denims for women in stylish designs like aztec prints, feather prints, paisley prints and more. The price range starts at INR 4000 but be assured that you are getting a design which is created by skilled artists and is fashionably special and unique. These were few of my favorite picks from their amazing collection. 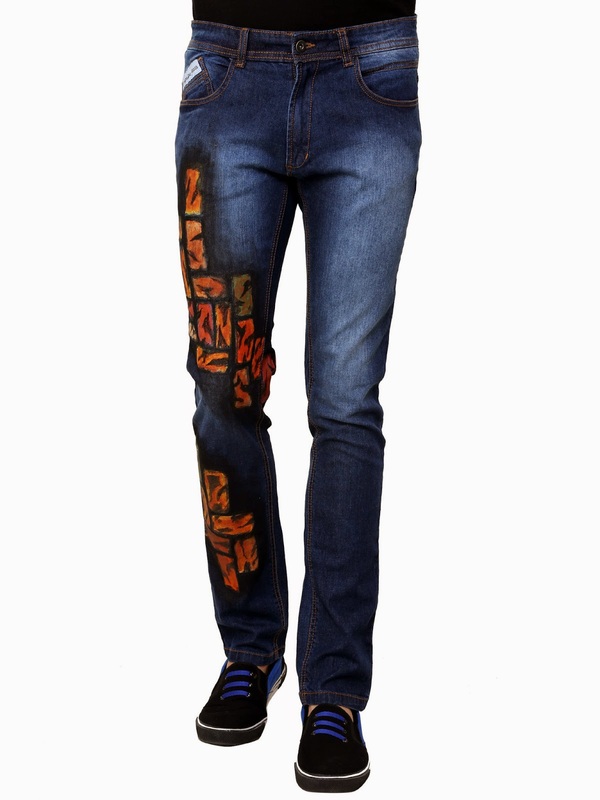 You can have a look at their range of hand painted denims and other products at www.rangrage.in. They Ship worldwide and also offer Cash on Delivery within India. Do you own a pair of a hand-painted article? Let me know what you think about the unique collection of Rang Rage in Comments below.